In reviving SEZs, Modi can liberalize without taking on vested interests. Faced with widespread opposition, by 2012 the then Indian government had all but abandoned incentivizing the creation of special economic zones (SEZ). The opposition came mostly from the thousands of villagers who were being forced to give up their land to make way for these industrial projects. Now, however, new Prime Minister Narendra Modi is talking up the possibility of reviving the SEZ policy. Why? It appears that Modi believes he can deal with pockets of opposition from displaced groups more easily than he can overcome the vested interests that will oppose economic liberalization outside of economic zones. Effectively, by reviving SEZs, Modi can limit reform to geographically isolated areas and avoid taking on the powerful interests that oppose liberalization, such as labor and some industry leaders. Ten years ago every major party in India was in favor of creating SEZs. These walled off zones were meant to encourage foreign investment and the export industry through extensive tax incentives. The incentives were hugely successful: In the first six months after the SEZ Act was passed in 2005 there were 212 accepted SEZ proposals for public and privately developed SEZs. However, these projects involved the displacement of thousands of individuals (read: voters), who not surprisingly opposed the projects, often violently. By 2008 projects were being cancelled due to local opposition. By 2011 some of the best incentives for SEZ development had been removed, state governments had been ousted for supporting the policy, and a host of the projects were cancelled or postponed indefinitely. Since taking office this summer Modi has been hinting that his government will revive and even boost the tax incentives for SEZs. Modi ran a campaign based on a pro-growth and pro-efficiency platform, which led many to believe he would push through tough but much-needed economic reforms. To date, though, he has avoided any new economic policies that could spark opposition from vested interests. The government’s first budget did not include any substantial reforms, and the new prime minister’s first Independence Day speech (roughly equivalent to the U.S. president’s State of the Union address) emphasized the need to boost manufacturing growth, but didn’t provide any details on how to go about doing this. Over the last twenty years India’s growth has been driven primarily by the service sector, including the well-known IT boom but also a burgeoning real estate and construction sector. This is somewhat at odds with the experience of other Asian nations that have seen rapid growth rates in the last few decades. Countries such as China, Taiwan and South Korea grew their economies by exporting labor-intensive, low-capital goods. In contrast, India’s growth has been driven by high-skilled and capital-intensive sectors such as IT. The problem with this is that the growth has not been able to provide employment for the increasingly large number of Indians seeking work. In this context, Modi’s emphasis on the need to boost the manufacturing sector is not surprising. This, though, entails taking on powerful vested interests. India has some of the strongest labor protection laws in the world, some of the most difficult bureaucracies to navigate, and increasingly stringent regulations on acquiring land for industrial purposes. Reform in any of these areas is extremely difficult because of the heavy hitters (such as labor unions, rural agriculturalists, and the public sector) that stand to lose if reform is enacted. Hence, Modi’s embrace of special economic zones. These fenced-in areas of liberalization allow the government to aggressively pursue reforms while avoiding clashes with vested interests. 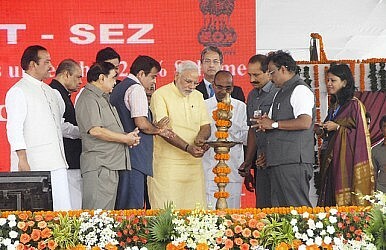 SEZs have a separate and dedicated Board of Approval, thus allowing Modi to avoid confrontations with the bureaucracy. SEZs have limitations on labor union actions, reducing conflict with unions. And the Modi government is now attempting to exclude SEZs from new legislation that makes it even more difficult for agricultural land to be converted to industrial purposes. What, though, to do about those displaced villagers? The last government was forced to roll back its SEZ policies in the face of opposition from the villagers and their supporters. However, that government did not run on a pro-growth platform. In fact, the Congress-led government had a stated goal of making sure the benefits of liberalization reached all people, and implemented extensive welfare programs (specifically the National Rural Employment Guarantee Act, which guaranteed employment for a limited number of days a year). When SEZs began to be viewed as anti-poor and anti-rural, it was unsurprisingly a problem for the government. In contrast, the new government has promised growth and economic reform. If SEZs are the easiest way to deliver on that pledge, Modi will be willing to take on rural interests to do so, rather than facing the possibility of defeat at the hands of much stronger vested interests such as labor and the bureaucracy. Alan Potter is completing his PhD in Politics at New York University. His work focuses on the political economy of South Asia and specifically how governments enact potentially painful economic reforms.